In October 2010 my wife and I spent a week in Vienna. It was my intention to make this trip a "pilgrimage-slash-treasure-hunt" devoted to Beethoven. Well, it was very rewarding, but it also had its share of ups and downs! I definitely have enough unchecked boxes to make a second visit. We flew Friday night from NYC to London/Heathrow, and then to Vienna airport. I listened to my German conversation mp3's on the plane. Fortunately almost everyone speaks English in Vienna! We had one very bumpy moment on the plane where I kept flashing back to the pilot episode of "Lost." I remembered that the guy named "Ed" on that show was knocked out by falling baggage (and eventually died) so I kept an eye on the overhead compartments. Anyways, we landed Saturday night without mishap and raced through customs because we had tickets to a concert at the Wiener Konzerthaus at 7:30pm and we had just landed at 6:30pm. After the cab driver took us to the wrong location (he kept thinking we were normal tourists and wanted to go to a hotel) we made it to the concert hall. The Wiener Konzerthaus ("Vienna Concerthouse") hall has the largest concert organ in Europe. It's historically used for more "modern" fare like Stockhausen and Ligeti, but tonite we were going to see the all-time revolutionary, Beethoven. I think the avant-garde element was that it was Paavo Jarvi conducting and that all the performers played like whirling dervishes. Maestro Jarvi and the Deutsche Kammerphilharmonie Bremen opened the all-Beethoven set by blasting through the "Creatures of Prometheus" Overture, paused to tune up, and then launched into the most articulate and energetic 4th Symphony I'd ever heard. It didn't hurt that we had 2nd row seats. After a brief intermission where I had half of a Snickers bar as my dinner, we returned to our seats and Jarvi and Co. let it all hang out with a no-holds-barred 3rd Symphony (Eroica). I have Jarvi's "Eroica" on CD but what I never noticed before was that for the 4th movement fugue variation, the principle string players play by themselves - that is, the orchestra stops playing and it turns into a kind of string quartet! Unbelievable. The ensemble itself is a somewhat smaller-sized orchestra, which gave the orchestration a more distinct flavor. It didn't hurt that the players seemed to be enjoying themselves immensely. After the Eroica, Maestro Jarvi conducted an encore of the "Turkish March" from the Ruins of Athens stage play. A nice dessert after the meat-and-potatoes Eroica. All in all the best Beethoven concert I'd ever been to. The remainder of the night consisted of some Vienna pizza (nope), a hipster bookstore/cafe called Cafe Phil and some hotel hunting. Paavo Jarvi conducting Beethoven at the Wiener Konzerthaus. In the lobby is the model for the Beethovengasse statue. The first major activity of Sunday was to attend a Schubert mass (Messe G-Dur, D 167) at the Augustinian Church. 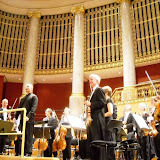 The conductor was Robert Rieder and it featured the Choir and Orchestra of St Augustin. We got there a bit late so we had to stand for the entire performance but I really enjoyed it (must remember to check out more Schubert masses). Sadly we missed a recent Beethoven "Mass in C" performance. Now that would have been something! Afterwards we went to Cafe Hawelka (featured in the graphic novel "Persepolis") and had some apple strudel. Next was the first Beethoven home to hit on my list, 11 Petersplatz. B stayed here in 1799 and 1803 on the upper floors. There were no Beethoven "flags" to be found, but the street looks largely the same. 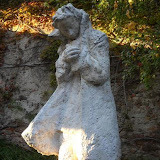 Nearby was "Zum Scharzen Kamel" (The Black Camel) where B was often to be found consuming wine, sugar and coffee. 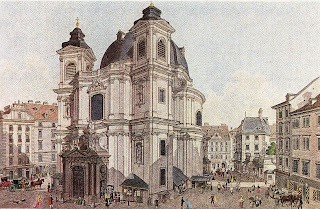 It was originally established in 1618, refurbished in 1801 and renovated again in 1901. That morning it was closed but later on we came back and had drinks and finger-sandwiches there. I could easily imagine Beethoven in a corner with friends shouting out politically incorrect opinions to all. Later, on Freyung street we passed the Kinsky Palace. Prince Kinsky was one of B's patrons, but died from a fall from his horse. 11 Petersplatz. Beethoven lived here in 1799 and 1803. "The Black Camel" was a wine bar which Beethoven visited often. 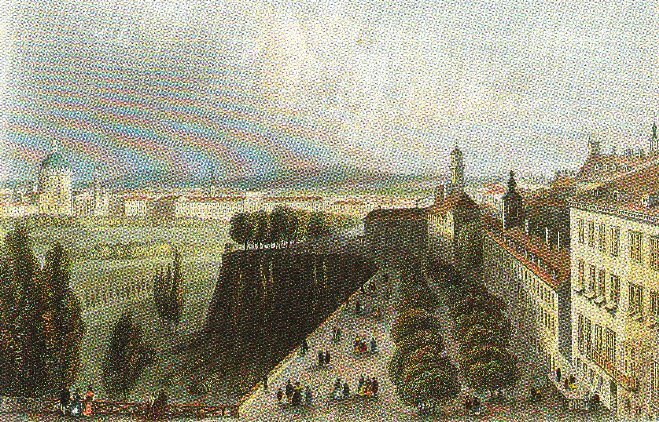 Palace of Prince Kinsky, one of Beethoven's supporters. Beethoven's grandfather: "Get to work." I have to admit the inside of the apartment didn't feel very "Beethovenian", since it wasn't his room or even a reproduction of his original apartment in any way - it was basically a 5-room museum which could have been anywhere, really. The true spirit of Beethoven resides in the street outside and the building stairs and exterior, since those would still be recognizable to Beethoven today. Beethoven must have enjoyed this view in 1850. Click on the square pic below to see many more photos of Part 1. This ceiling has heard it all. The Griechenbeisl restaurant opened 560 years ago. Beethoven ate here a mere 200 years ago. Hofburg Palace in Beethoven's day. Monday we explored the Hofburg Palace and learned all about Austria's famous Princess Sissi. Sadly, she was stabbed by an attention-seeking psycho. Seems some things never change. I was looking forward to visiting the Grosse Redoutensaal (Grand Ballroom) where B. premiered "Wellington's Victory",Symphony No.8, and Symphony No.7 but it is apparently closed to non-ballroom-dancing tourists. We tried to sneak in but a cleaning lady caught us. A couple nights later I tried to sneak in during some corporate event but I'm almost positive the security guys would have been worse than the cleaning lady. Fortunately there is an online tour of the ballroom. Taking a break from the "Beethoven-quest", we visited the Otto Wagner pavilion which is a famous "Jugendstil" architectural site. We also had lunch at the Palmenhaus Cafe which is situated next to a live butterfly preserve. We passed on the butterflies since it was kind of expensive to get in and "Butterflies are free". Redoutensaal today: From Beethoven to...this? Next was the day's highlight which was the tour of the Theater an der Wien. Beethoven was a resident composer here for a short time and held one of the greatest concerts of all time here on December 22, 1808. The setlist was the 5th and 6th Symphonies, the Choral Fantasia, the 4th Piano Concerto and more. It was a 5 hour concert. Read more about it here. The tour was in German but since I had brought my Beethoven notes with me I don't think I missed it too much. Inside the theater, I put the 5th Symphony on my headphones and tried to imagine sitting there in that concert hall 200 years ago and being among the crowd to hear that iconic "Ba-ba-ba-baam!" theme for the very first time! When we got on stage I could see what Beethoven must have seen when he conducted and performed there (except for the empty seats of course). Surprisingly the hall itself is relatively small compared to today's major concert halls. On our last day of the trip we returned for a concert featuring the music of Kurt Weill. Even though it wasn't Beethoven I got the feeling of what it must have been like to enjoy an evening of "contemporary" music....check out my video tour at the bottom. 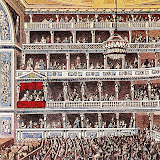 where the 9th Symphony premiered. Click on the square pic below to see more photos of Part 2. The first stop on Day 4 was another B. home, 22 Laimgrubengasse. He worked on the 9th Symphony here in 1822. This building is well-preserved and looks the same as it did when B. lived here. The front door was open so I walked inside a little bit to get the vibe. Just like Molker Bastei, it's surprisingly humble. Beethoven did not like the limelight and moved around alot to evade curiosity-seekers looking for the famous "deaf composer". The room where B. stayed at is open to visitors with an appointment. I decided to save that for another time. We headed on towards the Secession museum building where Gustav Klimt's "Beethoven Frieze" is on display. Frankly I wasn't too excited on the way since it really had nothing to do with B. 's actual life in Vienna, but I ended up enjoying it quite alot. Klimt was commissioned to create this huge wall mural as part of the entrance to a massive Beethoven sculpture at this art exhibition. Mahler even made a special trombone arrangement of the 9th Symphony for the event. Personally I'd never seen it before - but I loved it! 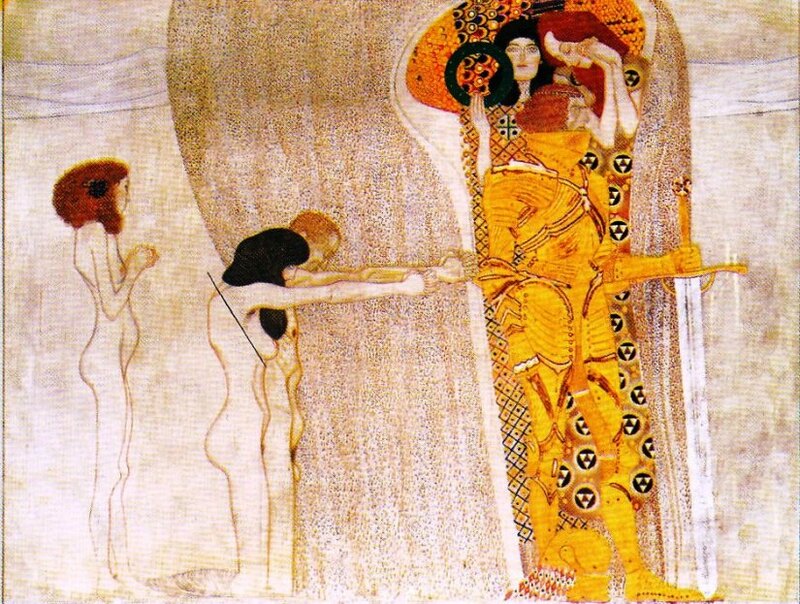 This Klimt fellow is not bad at all. I think he has a real future ;). Our next stop was Heiligenstadt, where B. first stayed in 1802 and worked on the 2nd Symphony. More significantly, here he first realized that his deafness was not curable and was despondent enough to write a suicide note/last will. Fortunately he decided that "Art must live!" and the note (The "Heiligenstadt Testament") was not discovered until B. 's death 35 years later in a secret drawer in his desk. B. eventually stayed in Heiligenstadt several times, usually in the summer to escape the high heat of Vienna. We took the U4 U-bahn which is Vienna's subway system. It was only 20 minutes by U-bahn, whereas in B's time it was 1.5 hours by horse-carriage. Many houses here are preserved from when B. stayed here, including 26 Kahlenbergerstrasse and 64 Grinzingerstrasse. Actually there is some question as to if B really lived in 26 Kahlenbergerstrasse, but at least he was in the neighborhood. I had a weird moment of cognitive dissonance when a 19th century train drove past his house. From these small homes, we worked our way up Eroicagasse (Eroica Alley) to the Beethovengang which is a walking path which B used often. 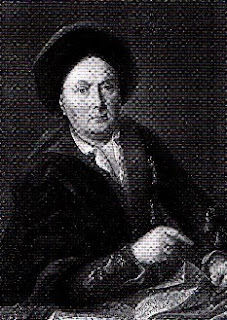 It follows the Schreiberbach stream which might have helped inspire B. to write the "brook" music in the 6th (Pastoral) Symphony. The path itself is absolutely fantastic and I probably felt closer to Beethoven on this path than at any other point in the trip. Beethoven must have walked here a hundred times. At the end of the path is the Beethovenruhe (Beethoven rest) where there is a fine bust of B. mounted on a tall column. It was very restful. Nearby there are vast vineyards and we trespassed on one to try some grapes off the vine. Tasty. This made us feel so "guilty" we had to head towards St Michael's Church where nearby is the famous "walking statue" of B. This full body figure is just a bit larger than life size but from a distance I'm positive it could be mistaken for Beethoven's ghost walking around here at night. Moving away from the Heiligenstadt Park, we hit the 6 Probusgasse cottage which actually houses TWO independent Beethoven museums. The funny thing is, there's no hard evidence that B. lived in either of these apartments. Nonetheless it seemed likely to me that he did, just a vibe I got. Just like the Pasqualati House museum, the scores are all facsimiles, but everything else is genuine including a lock of Beethoven's hair (the piano however is not - as far as I know the only piano which Beethoven actually played which still survives is in Bonn, Germany). Again, the museums are fine and all but they don't say "Beethoven" to me, they say "museum". Some nice exhibits though. Lock of The Maestro's hair. Click on the square pic below to see many more photos of Part 3. Cream of Garlic Soup from Beethoven's house. 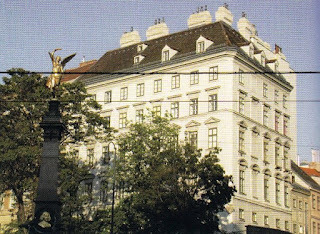 Part 4 - Beethoven's 1st Apartment - Josefstadt Theater - Lobkowitz Palace - etc. After returning to Vienna from Heiligenstadt we stopped in at the Cafe Restaurant Winter. Not only can one find the best cream of garlic soup in town, but it is also the same building B. first moved into when he set up permanent residence in Vienna when he was 22. At the time it was the "city-palace" of Prince Lichnowsky, one of B. 's most important early supporters. I mentioned this to the extremely nice waiter and he remarked "Really? I didn't know Beethoven lived here. That was before my time". Funny guy. The other thing to note is that this apartment is WAY out on the outskirts of Vienna. Which makes sense since it was his first lodging - he wasn't yet famous. Ironically, on the same street is the Trinity Church where Beethoven's funeral was held. I hadn't planned on visiting this site so it was a surprise to find it. Inside it's like no church I've ever seen before, but I'm no church expert either. Heading south we hit 57 Josefstadtstrasse which is reportedly B. 's favorite apartment location (1820). He was only here briefly though, so he was probably evicted for making too much noise. I couldn't find a plaque to mark the occasion and I'm not sure if it's the same construction. I noticed that it's on the outskirts of central Vienna so I could imagine he was able to hide from celebrity-hunters here more effectively than when he was a stones-throw from the concert halls. A little ways down is the Theater in der Josefstadt. Here B. composed and conducted the "Consecration of the House" overture to celebrate it's re-opening in 1822. I noticed that the doors were open so I stepped in to take some snapshots. A few moments later a crowd of well-dressed people came out of the corridors and I realized it was intermission of the evening's show - so I quickly raced into the theater auditorium to get some footage. This was an unexpected bonus since hitting the Josefstadt theater was not even one of my main targets. All in all it was quite a day. I made a video out of the few seconds of footage which is at the bottom but I also found an online "virtual tour". The descending curtain of the Josefstadt Theater stage. Front door of Lobkowitz Palace where the 1st Eroica rehearsal took place. We spent the next few days largely devoted to my wife's interests which included the Klimt and Schiele exhibits at the Leopold Museum and the Belvedere Palace. The Kasekreiner (pork sausage stuffed with cheese) we had for lunch at the Nachtmarkt was delicious! I did stop at the Beethoven store near the Molker Bastei apartment (which was closed on Day 2) and picked up my souvenir LvB bust. It is by far the best bust I saw in Vienna...and only 3 inches high! The store itself was somewhat smaller than I had hoped but featured custom artwork incorporating Beethoven imagery in some kind of mixed-media collage. We also had the "best wiener schnitzel in town" at Figlmuellers (frankly I'm not crazy about wiener schnitzel) and the waiter bumped into my pen while I was writing down journal notes (without apologizing). This is as good a place as any to note that my impression of the Viennese is that in their "service roles" (waiters, shop owners, etc..) they are somewhat contemptuous of tourists (beside the one at Cafe Winter)...but if you run into them on the street they are extremely nice. Twice I was asked by a local if I needed help (one lady escorted me 2 blocks to the train station) - and twice we were treated to free beer. Actually Vienna was voted "#1 most livable city" not too long ago. Later in the week we stopped at Cafe Frauenhuber (formerly Jahn's Restaurant) where Beethoven and Mozart both performed (tho not at the same time). You can find another of those virtual tours here. We later bought some chocolate at Demel's and knocked on the door of Artaria's (one of Beethoven's early publishers - not the original building). One evening we had sausage hot dogs from a food stall inside a parking garage. What a great idea...I think. 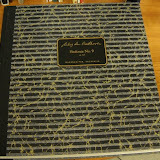 I had some serious "book-lust" at the Doblinger Musikhaus which is Vienna's largest sheet music store. Here I was able to look at gorgeous facsimile editions of Beethoven's 9th Symphony as well as the Eroica and Pastoral facimiles. The Eroica was only about $1800...that's alot of "sacher tortes". They are beautiful works of art even if they are facsimiles. One evening we attended a performance of Mozart's "Requiem Mass" at Karlskirche (St Charles' Church) which was performed on "historical" instruments. It was a fine performance but it was our 8th or 9th church on this trip and I was getting chapel-fatigue. On day 7 we stopped in at the Haus der Musik which is a kind of inter-active music museum using "cutting edge technology". It's a well-intentioned museum but we weren't here in Vienna to hear techno versions of Mozart and Beethoven (we also stopped at the Arnold Schoenberg Center which I will write about tomorrow as an addendum). Day 6 was spent in nearby Budapest, which is easily reached by train. Budapest is also very walkable and has a much different vibe so it was a nice change of pace. The castle there is pretty amazing. The last Beethoven site we managed to fit in was the "Zum Alten Blumenstock" inn (The Old Flower-something) at 6 Ballgasse. When Beethoven lived in this building he worked on the Missa Solemnis while eating at the inn below, which B. considered his greatest work. The whole trip was capped off by the concert at the Theater an der Wien which I already covered in Part 1. The Ballgasse alley where Beethoven strolled. It was a great experience to visit all these places to see how Beethoven had lived and worked. I think it gives some insight into his daily life and working conditions. I believe living in Vienna was important to Beethoven because of the easy access to great musicians, music patrons and celebrated concert halls - all within a 15 minute walk from his apartment. However the city has changed so much (and is overrun with so many cars and tourists) that it was hard to walk around and think "Ahhhh..Beethoven!" all the time. The smaller cobblestone streets (late at night) were the best for that kind of thing. Many of B. 's homes have been demolished, but the ones which have been preserved are very evocative of a man serious about music and uncaring about luxuries. The highlights were easily the Theater an der Wien, Heiligenstadt's Beethovengang river walk and the Pasqualati House. All in all it was a pretty full trip and there are many more Beethoven sites I didn't have time to see including his homes in Baden, Dobling and Modling, his cemetery site(s) and a fairly long "Beethoven-walk" across the Danube river where he stayed with a female admirer. Click on the square pic below to see more photos of Part 4. There were only 2 real disappointments on this trip and they were the closed Hofburg Redoutensaal and the closed Lobkowitz Eroicasaal. Fortunately we can take a virtual tour of the Redoutansaal here (look for the Grosse Redoutenstiege and then go into the room ahead) and here's a page with some good pictures of the Eroicasaal - also here - oh well, next time! I have to mention this book I got in Vienna which is simply the best single paper guide for searching for musician sites in Vienna. : David L. Nelson's "Vienna for the Music Lover:" I did months of research preparing for this trip and this book has almost everything I dug up. Finally, I uploaded my exhaustive notes in preparing for this trip - it is a combined document including all relevant info I could find from the above links. It's not complete, and the formatting leaves something to be desired - but it should be helpful.....here.